The Eye of the Storm: Assessing Brainstem Distress with the Pupillometer. Sunday, March 3, 2019, Japan Society of Intensive Care and Emergency Medicine (JSICEM), Kyoto, Japan. 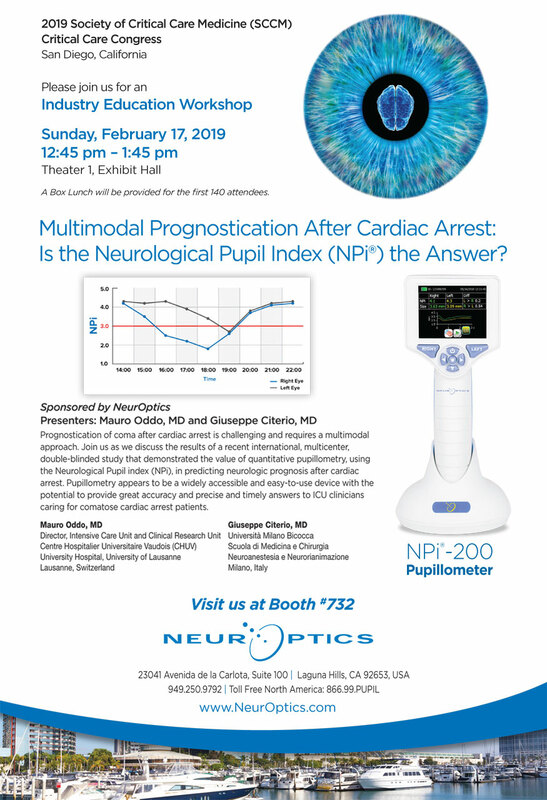 Multimodal Prognostication in Cardiac Arrest: Is the Neurological Pupil index (NPi®) the Answer? Presented by Dr. Mauro Oddo, University of Lausanne, Switzerland, and Dr. Giuseppe Citerio, Università Milano, Italy. Industry Education Workshop – Sunday, February 17, 2019, Society of Critical Care Medicine (SCCM) Critical Care Congress, San Diego, CA. View invitation and details.